To many, Heathrow could resemble a massive car park with runways along the middle. According to Heathrow’s financial reports, car parking makes a substantial contribution to HAL revenues, £52m in the first six months of 2015 which is up from £48m in the same period of 2014. With 23,000+ on-site parking spaces, Heathrow offers both business travellers and tourists a range of services in a variety of surface and multi-storey car parks. Public parking is the second biggest retail activity after duty and tax free shopping. While parking is a key revenue generator, Heathrow points out that it is investing in ways to reduce emissions from road traffic. Heathrow’s action plan for 2015 states that it will incentivise low-emission vehicles and provide more electric vehicle charging points. Holland-Kaye says: “Heathrow is working with partners to champion a joint approach to reducing emissions from road traffic in the Heathrow area and is working with Transport for London and other stakeholders to formulate a regional strategy for air quality.” It is difficult to imagine how a few hundred electric cars will offset pollution generated by 740,000 planes. Freedom of Act request shows Car Related Modes of Transport to Heathrow is increasing and not deceasing as Heathrow claims. Since Heathrow claimed that they are working with Transport for London, TAG submitted an FOI on the Department for Transport requesting details related to car travel and Heathrow (Freedom of Information Act Request F0013162.) Based on the information provided in response to this request, it does appear that car travel related to Heathrow is increasing and will likely increase as part of any expansion based on these trends. The figures provided in the FOI response show that rail and tube travel has remained static for the whole period between 2011 and 2014 at 12m passengers per year. Road (including cars, taxis and buses) has increased from 32m in 2012 to 34m in 2014 – an increase of 2m road journeys in only 2 years. There is simply an insatiable demand for road use and people will always use this option if it is easy to do so. Davies, in his final report, depends on NOx and CO2 reductions being entirely dependent upon planned car travel mitigation factors being successful. (for example, road pricing) The figures provided by the DfT show that there is very little chance of this happening. Davies does not explain the changes expected. It is very likely that short of barring all road traffic, placing a quite unmanageable strain upon TfL, none would work properly to prevent air pollution deteriorating further than the current levels which are already in breach as noted by the Judge’s ruling on The Heathrow13 today. 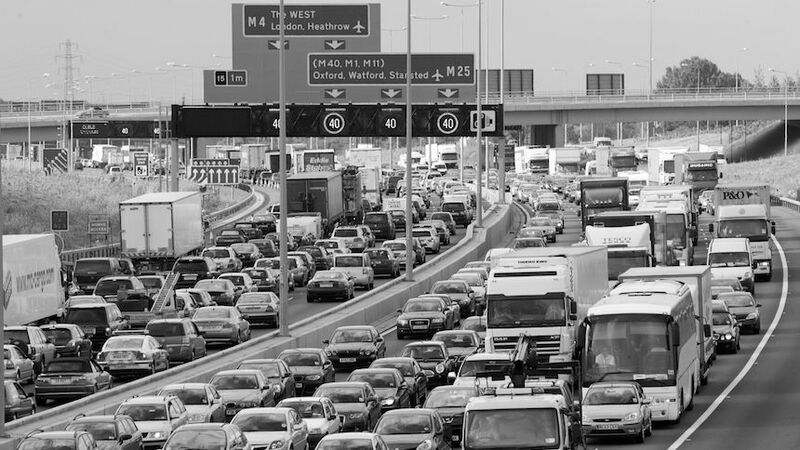 Considering that road use mitigation factors are unworkable and that car parking generates over £100m in revenue for Heathrow, any claims that airport related car travel will remain static or decrease are unrealistic at best. 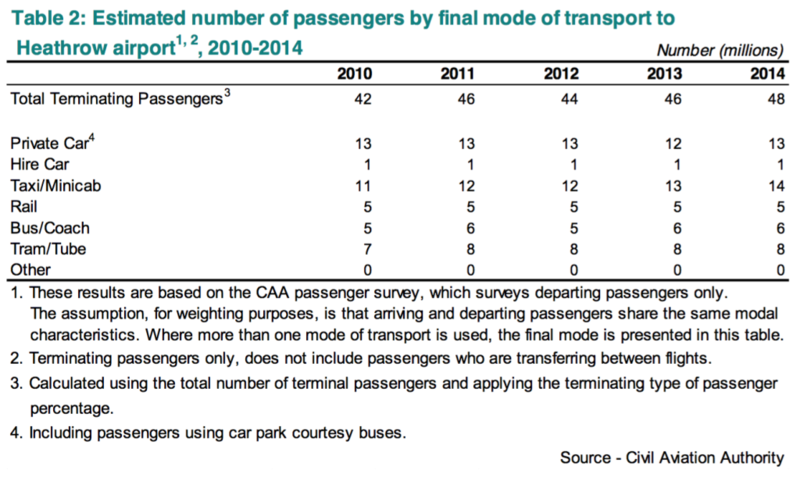 Considering your final point about the revenue that parking brings in for Heathrow, its interesting to note that the amount of journeys that use the parking has remained static for the last five years. You conclude that as there has been a 2 million increase in passengers travelling by road to the airport, that there has been a 2 million increase in the number of vehicles on the road over this period. This ignores how many passengers are actually using each vehicle. Having arrived into Washington Dulles airport recently I came across a somewhat different taxi/minicab method. At a desk in the terminal you give your destination and then are assigned a taxi. The taxi has 3 or 4 other groups of people in going to destinations in the same area as yourself. This means that only 1 taxi is used instead of 1 for each group (in my case we used 1 taxi instead of travelling separately which would have taken 4). This could drastically reduce the number of taxi’s using Heathrow. This method could also be used by people travelling to the airport by booking in advance. Finally, you have pointed out that the number of passengers using public transport (rail/tube) has remaining constant. Over your period of analysis there has not been any new form of public transport built, hence is it such a surprise that the number of people using it has remained roughly static. Quite a lot was done to define cordons and charging schemes – and then it was found that the new Euro standards for cars would mean that there wasn’t a problem to solve after all……..
That worked well then , didn’t it ? I don’t think it will be a quick exercise to determine appropriate vehicle emission factors out into the future, particularly if Europe seems determined to have weak “conformity factors”.